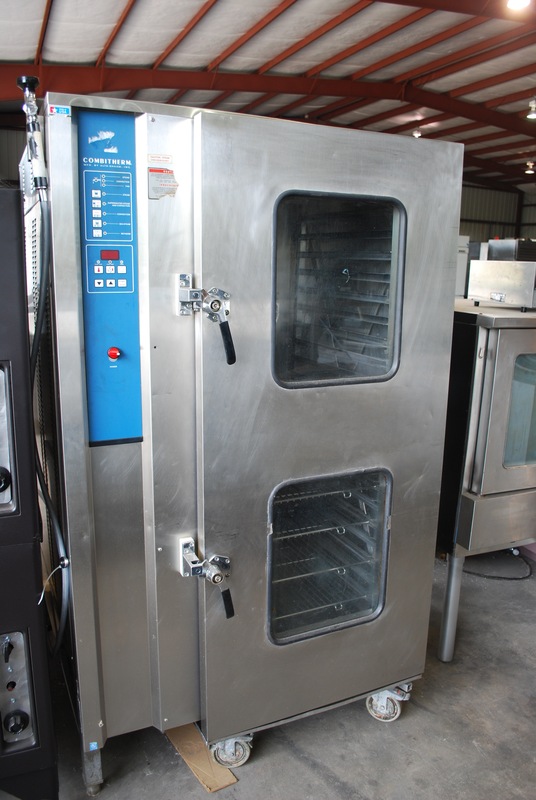 One Fat Frog Restaurant Equipment has a used, Full-size Alto-Shaam CombiTherm Oven for sale at a very low price. Combi ovens can cut cook times in half and replace less efficient equipment, but only as long as you keep them running smoothly. There are some relatively easy steps to take to keep combination ovens working smoothly and in top condition. The most important thing you can do is read the manufacturer’s recommendations for the use and care of the combination oven. Another important and obvious thing to keep in mind is to regularly clean the combination oven. Most manufacturers recommend that you clean the interior of the combination oven at least once a day and more frequently if necessary. Also remember to keep your temperature probes clean and take advantage of the combination oven’s cleaning cycle mode. It doesn’t get much easier than that, folks. One Fat Frog restaurant Equipment currently has a used full-size Alto-Shaam CombiTherm oven available for a seriously discounted price. One Fat Frog Restaurant Equipment can get you financed for this Alto-Shaam CombiTherm Oven no matter what condition you find your credit in. One Fat Frog Restaurant Equipment also offers quick cash and package deals for all of its used commercial restaurant equipment – including this used full-size Alto-Shaam CombiTherm Oven!